It was another lovely sunny spring morning as I started to wake up while Adam, my husband, was getting ready to leave to work about 8:30am. As I got up I lost some water, thought that was a bit odd, had I just weed myself? Carried on down to the bathroom to have my shower, as I had my shower, got dressed and had my breakfast I was loosing more and more. It was trickles of water. When I bent over rather than an obvious gush, with no contractions at all. After a while I had changed my knickers a few times and soaked a few sanitary towels, I realised my waters must of broke, surely I couldn’t be that incontinent! I called the midwives at the Crowborough Birthing Centre (CBC) and Tracy, one of the midwives I knew, answered, I arranged to go and see her at noon. Thinking this may be the start of things I made sure my hospital bag was all ready in case at any point I had to go there and busied about the house until it was time to go. Funnily enough it seemed as though everyone and their cat and dog decided to text and phone me that morning, but I didn’t say anything! Hopped into the car and drove myself to the birthing centre where I had the usual tests - urine test, blood pressure, baby’s heartbeat as well as a swab test. Traces of blood and protein in the urine test confirmed to Tracy that indeed my waters had broken. Tracy explained I had to take my temperature twice a day and if nothing had started by the following morning I’d need to pop to the hospital for an antibiotics injection in case of infection. And then every 24 hours up to 96 hours I’d be asked if I’d wanted to be induced. Half an hour or so later I left Crowborough and came back home. Because of the ticking time game that had started and the possibility of intervention, I was determined to get things started, this baby was coming out! I also found out which of the midwives was on rota that night if things did get started - I think this contributed to feeling confident about getting things going as I liked and felt very comfortable about her being there to support me (there was only one midwife of the possible 3 that I didn’t click with and therefore didn’t want her to be there as and when it happened). I had a good lunch and got down on all fours and started to move my hips around in circles and concentrated on the thought of my cervix opening. Adam got home about 2:30 -­ 3pm as he couldn’t concentrate at work. I think this actually also helped I was that bit more relaxed and ready to get things started knowing he was home too. We went for a little walk around the block and by about 4pm I was having really little contractions -­ hurray! Earlier in the day I had phoned Amanda to see if I could get an acupuncture appointment with her, as I knew this can also help move things along. At 5.30pm Adam drove me to Amanda’s. The acupuncture Amanda gave me was for balancing and energy and had things not continued I would have gone back the next morning - but there was no need! Afterwards Adam and I popped over to my parents (10 minutes drive) to pick up a mattress we’d been meaning to get for a few days, my mum was very chirpy and definitely suspected something, but we didn’t say a word and nor did she! Home again Adam made a dinner of pasta and vegetables, hearty and high carbs, I managed to eat it all up with a few breaks in between when I had contractions. We then called the CBC to let them know things had started, Tina answered and she advised us to keep a note of the contractions and call back when they were 5 minutes apart and lasted a minute. Things progressed well it seemed into the night, contractions getting more intense. We were both so excited and laughed quite a lot in the first few hours. I found if I was at all distracted with say talking on the phone to Tina the contractions seemed to stop, well held off until I relaxed again. As the contractions continued I tried to lie down in between, but found that it got increasingly harder to get up on all fours when the contractions did start, it was as though they were more intense if I did this, so I stayed on all fours leaning against my birthing ball or the sofa. By about 2am the contractions had really intensified; we seemed to have skipped the 5 minutes apart for 1 minute to 3 minutes apart for 1 minute. Adam phoned back CBC and asked Tina if the midwife could come out soon! Debbie Gower arrived about 2:30am. At about 3am I was 3cm dilated. A student midwife, Victoria, arrived 4:45am. I could hardly acknowledge them on their arrival, could just hear them in the background cheering me on. They constantly encouraged and reassured that all was going well and to plan. I was sick a couple of times, not particularly nice, but I believe is a sign of moving from first to second stage, all normal and part of the process. I used the Tens machine from early in the evening till some point in the early morning, it certainly seemed to help distract from the pain if nothing else. I could have had gas and air but never thought about it so never asked. By 6:20am I was fully dilated and started pushing. I was at first on all fours leaning against the sofa, but at some point Debbie advised I should stand up, which I did and used Adam as support - I ended up basically hanging off him as I pushed with all my might to get the baby out. I remember at some point saying, “right that’s it I’ve had enough of this game.” I also remember thinking, “thank goodness I don’t have two to get out” as I thought of a friend who was expecting twins. I was really thirsty, as I lay there collapsed between each push having a few sips of water (very useful to have a straw so the glass could be held towards me and the straw just stuck in my mouth). At last, little Elliott was born on 26th April 2009 at 7:21am. As I was standing up and Adam on the sofa, Elliott was handed straight through my legs to a very exhausted and emotional dad. I stood there all a bit dazed and confused. Soon sat down and was handed Elliott. After half an hour I stood up, pushed and the placenta was delivered. Elliott was weighed and checked over by the midwives. They also ran me a bath, helped Adam dress Elliott and made us cups of tea. They stayed with us for quite a few hours to make sure we were all ok. After they left we wondered upstairs to our bed and lay Elliott between us. Adam fell asleep as I lay there staring at our little creation, our new life as parents had really just begun. 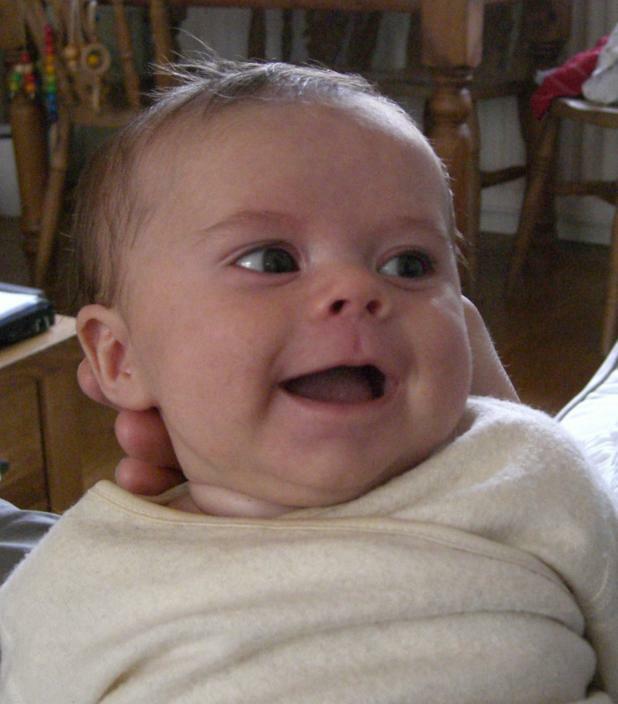 Elliott is now fourteen weeks old and a very happy little baby. It all seems such a long time ago life before his arrival. Certainly different but I wouldn’t swap it for the world. I was very fortunate to have a very easy and enjoyable pregnancy. I had no morning sickness or any other not so pleasant side effects. Deciding to have our baby at home wasn’t an instant decision; it wasn’t until we had completed the antenatal classes that we made the decision. We did the CBC, NCT (National Childbirth Trust) and Amanda’s classes. Once we understood what giving birth entailed it was then that we decided that doing it at home was the obvious choice for us. I would suggest to other mum and dads to be, that they don’t decide where they have their baby or at least stay flexible until you have done your antenatal classes, having learnt all about giving birth gave us the confidence in knowing that it could be possible at home we were also lucky to have full support from the CBC midwives.